Cook the quinoa in boiling water. Cut the zucchini lengthwise. Sprinkle them with salt and pepper, rub them lightly with olive oil and bake them for 20 minutes in a preheated oven. Sprinkle the pangasius with pepper and put a thin slice of butter on top of each fillet. Place the pangasius on the zucchini, squeeze lemon juice over the fish and put the baking dish back in the oven until the fish is cooked. Meanwhile cook the ham in a frying pan without any oil and break it into little pieces. Add lemon juice to the quinoa. 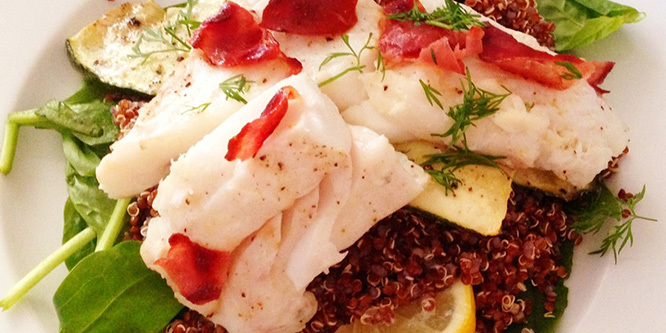 On a plate, put a handful of spinach, some quinoa, then the zucchini and fish on top. Sprinkle with the small pieces of Serrano ham and serve with some lemon wedges. Geert is a famous Dutch chef. He is also a master teacher for the hotel and catering industry. He has inspired many students to prepare innovative menus. In 2014 and 2015 Geert became the face of the Pangasius, Your Everyday Fish campaign and inspired both Vietnamese producers and European buyers with exceptional out-of-the box panga recipes. Learn more about pangasius and other stories beneath your plate.